These wonderful Peridot earrings are the ones you have been searching for on your whole life. These studs stand out in an extra ordinary way, which will round up compliments like there is no tomorrow in sight. These wonderful earrings were naturally crafted with 14K White Gold. These studs, being set into this type of metal is a great addition as it really helps the wonderful green fixture make its bold remarks with a subtle stone. These stones will remain in place all night, or all day considering they are accompanied by push backs. Push backs are great for making sure that the stones will remain in place, and you will not experience any uncomfortable feelings while these are being worn at any time. 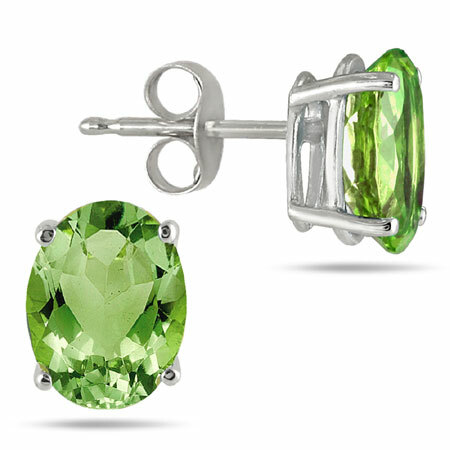 We guarantee our 6x4mm Oval-Cut Peridot Studs Set in 14K White Gold to be high quality, authentic jewelry, as described above.